This machne has moved to the National Wax Museum Plus. <p> The National Aquatic Centre (NAC) is an indoor aquatics facility housing a 50m swimming pool, diving pool, leisure pool and fitness center. Since opening in March 2003 it has hosted the swimming events of the 2003 Special Olympics World Summer Games, the 2003 European Short Course Swimming Championships and a number of international water polo events. <br> It hosts the Irish Open Swimming Championships, Irish Senior Water Polo Cup, Irish Open Diving Championships, as well as a number of other national and regional aquatic events. 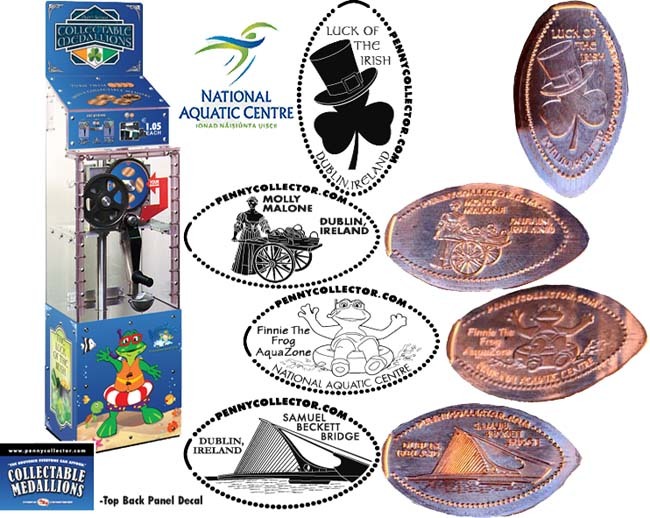 <p> Machine designs are: <br> 1) 'Molly Malone', with Civil War Cannon, <br> 2) 'Luck of the Irish', Top hat on clover, <br> 3) Finnie the Frog AquaZone', Finnie in tube, <br> 4) 'Samuel Beckett Bridge. <p> 12/26/16: A new Pennyman 4 design hand crank machine was installed here. This machne has moved to the National Wax Museum Plus. The National Aquatic Centre (NAC) is an indoor aquatics facility housing a 50m swimming pool, diving pool, leisure pool and fitness center. Since opening in March 2003 it has hosted the swimming events of the 2003 Special Olympics World Summer Games, the 2003 European Short Course Swimming Championships and a number of international water polo events. It hosts the Irish Open Swimming Championships, Irish Senior Water Polo Cup, Irish Open Diving Championships, as well as a number of other national and regional aquatic events. 12/26/16: A new Pennyman 4 design hand crank machine was installed here.